After my great success with the Pumpkin Spice Martini last month (at a baby shower, no less), I decided that I should work on a Christmas themed martini too. Peppermint is one of those flavors that takes you to a certain, time, place or season. Coffee shops and bakeries are very deliberate on when they release their peppermint flavored treats to tie in the with joy of the season. Last year it was almost a crisis at Christmas when we went to multiple grocery stores and they were sold out of peppermint ice cream. Then add a splash of peppermint coffee creamer. Shake until cold. 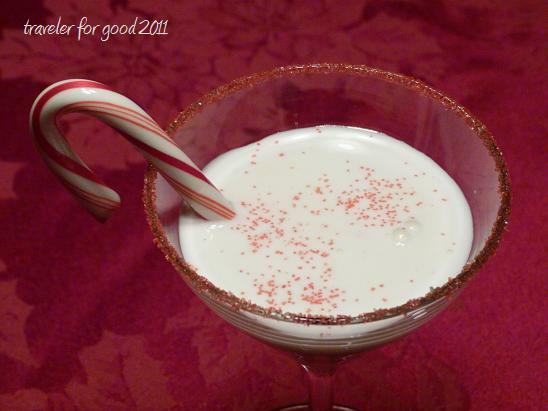 Rim your martini glass with the same red sugar sprinkles you use for decorating Christmas cookies. Strain the martini into the glass. Garnish with a candy cane and red sugar sprinkles. Cheers! In non-martini news, I'm hosting an OXO Good Cookie giveaway until December 15. Click here for details.